The air was thick, murky, and strangely hot and humid for leaf-bare. The fog surrounding Scorchstar was almost suffocating. He had to take in deep breaths just to get enough oxygen into his lungs, but with every breath it felt like dozens of tiny, thorn-sharp claws pierced his lungs. Breathing shouldn’t have to hurt. The ShadowClan leader looked around, trying to find anything recognizable around him to indicate where he was. Alas, he couldn’t seem to make out anything through the thick fog surrounding him. Only when panic began to grow within his chest, however, did something finally catch his eye from the distance. There was a faint, fuzzy orange light that Scorchstar could just barely make out. Deciding that following this lead was the only option he had to figuring out where in StarClan’s name he was, the tom began padding towards it. It felt as though he were treading through thick mud with every step he took towards the light, as if the fog itself was slowing him down. Only once he was practically right on top of the light source was he able to make out just what it was. It was a daisy with white petals and a yellow center. However, what struck Scorchstar as odd was that the head of the little flower was flickering with a small flame, yet it didn’t seem the Fire was affecting the daisy in any way. A loud, deafening roll of thunder from up above caused Scorchstar to look up sharply, instincts alerting him that something was amiss. Through the fog, he could clearly see the forming and settling of large, dark storm clouds covering the entirety of the sky. With a sudden strike of lightning, the blinding white bolt shot down to the ground and engulfed the entire area around the tom in wild flames. Fur bushing out in fear and alarm, Scorchstar couldn’t help but remember the uncontrollable fire that had shrouded the battlefield during the climax of the Clans’ battle against Lichenmask and his followers. That’s when the rain began to fall. Scorchstar quickly noticed, however, that the rain didn’t look, feel, or even smell like normal rain. As the droplets splattered to the ground and on his coat, he quickly noticed the dark russet color of the rainfall and how it clung heavily to his long fur, the stickiness of the unnaturally warm water making his uncomfortably squirm. And the scent! Great StarClan, it smelled putrid! Scorchstar began to cough and hack as the unbearable stench of sickness and death filled his nostrils with a hint of rat. With a terrified jolt, Scorchstar came to the conclusion that the rainfall was actually diseased rat’s blood. He felt as though he was going to vomit. What scared him the most, however, was the flower’s state in the midst of the strange rainstorm. The flickering flames on the Daisy’s head began to grow smaller and smaller as thick drops landed on it, a faint sizzling being heard over the pattering of rat’s blood all around him. When the flame was finally extinguished, the flower collapsed on itself and turned into burnt ash, which began to dissipate and seep into the ground as more drops fell on it to wash the remains away. The flaming daisy had been killed by the diseased rat’s blood. Scorchstar’s own blood turned to ice as he stared down with wide eyes at the spot where the seemingly invulnerable daisy once stood. There was clearly no misinterpretation here; he had went to sleep with choosing a new deputy for ShadowClan on his mind only to have a dream of a flaming daisy perishing in a storm of rat’s blood. Even though he had appointed Wildstrike to be temporary deputy firing Froststone’s recovery, he had very badly wanted to make his best friend Daisyflame deputy instead. But he would only be killed if he were ever made deputy. At that realization, right before he woke up from this nightmare, he could have sworn he saw an adolescent buck standing eerily still in the distance, seeming to watch him closely, reveling in his absolute terror. Scorchstar sighed heavily as he watched his Clanmates buzzing around in camp like a hive of bees. It had been a day since his announcement of Froststone’s demotion from deputyship and Wildstrike replacing the sick warrior as ShadowClan’s newest deputy. Most of the Clan has accepted and approved of his choice, but he knew of one cat who definitely did not. ”Oh, Daisyflame...” He’d hardly seen hide nor tail of his best friend ever since the Clan meeting yesterday. He remembered the look of utter disbelief mingled with confusion and a touch of anger he saw on the splotched warrior’s face when he hadn’t named him deputy, and it was truly painful to see. But there was a reason why he hadn’t chosen Daisyflame. It was all because of the dream he had. Despite the fogginess of the area surrounding him during his dream, the message it delivered was clear as day. Daisyflame could not become deputy, lest he fall victim to a tragic end. It truly pained him to no end. While he was glad Wildstrike was his deputy now, as he had been one of his choices when he had just become leader many moons ago, he just couldn’t deny how badly he wanted his best friend to be his second-in-command instead. It was very clear his friend was hurting. He had been denied of deputyship two times in a row with no seeming explanation for the second time. It was only fair he explained himself to the tom. Standing up and slipping out of his den underneath the sturdy roots of the old oak tree, Scorchstar padded slowly through camp until he was able to pick up Daisyflame’s scent. Following the scent trail back to the warriors’ den, he peered inside to see his best friend curled into a tight ball in his nest. The splotched ginger-and-white tom was not one to oversleep. He just have been really depressed. Scorchstar’s heart broke even more. After Scorchstar's announcement on who the new deputy would be, Daisyflame had stormed off, blew off some steam with hunting, and when he'd returned back to hunting, he didn't say a word to Scorchstar or any-cat for that matter. After the leader had appointed Wildstrike as deputy, he'd never felt more confused. He hadn't been chosen, yet again, but why? He was the perfect cat to lead by his so called "best friend's" side, so why in Silverpelt's hadn't he been chosen? Ears twitching at the sound of some-cat's voice, the ginger and white tom opened his eyes, but didn't move a muscle when he distinguished the voice as Scorchstar's. Having been curled up facing away from the entrance of the den, he didn't dare move and pretended to be asleep, but after a few moments of silence, the guilt of him tricking his friend in such a way over took him and giving his legs a stretch, stood up from where he'd been laying. Turning around, he met the leader's amber gaze with a cold one, tear stains visible under the sides of his eyes. Pushing his way past the tom, he made his way into the frigid camp air. Not saying a word or waiting, Daisyflame made his way to the camp entrance before waiting, his ears flat against his head and tail low. Turning around, he waited for Scorchstar. Seeing just how broken and utterly betrayed Daisyflame looked absolutely broke Scorchstar's heart. Stars, he was the worst friend any cat could want. But ... there was still a reason for why he hadn't chosen Daisyflame to be the next deputy of ShadowClan. Hopefully he would understand. He desperately hoped he would. Slipping out of camp past the ginger and white tom, Scorchstar stood a few tail-lengths away from the entrance, waiting for Daisyflame to follow him out. He sighed softly, ears lowered, eyes downcast for a few moments before looking up into his best friend's amber gaze. "Daisyflame. There's ... something I need to tell you. Please, just hear me out before you say anything. There's ... a reason why I didn't choose you to be deputy after Froststone fell ill. I ... I had a dream the night before I named Wildstrike the new deputy. In this dream, I was walking in the marshes, and I came across a daisy that was flickering with flames. It ... didn't take me long to put together that it was symbolism of you. There was ... so much chaos. Screams of the battle against Lichenmask moons ago ... heavy raindrops of blood that fell from the sky ... thick clouds of fog ... and the flame had been extinguished, the daisy crumpled to dust, and the blood washed the remains away completely. "I knew instantly what the dream meant," Scorchstar continued with a defeated sigh. "If I had chosen you to be deputy ... you would die. I know that you would die anyway, everyone does, but ... I was scared. I didn't want to lose my best friend. That's why I had chosen Wildstrike to be deputy." He turned his head away, closing his eyes, trying to keep building up tears at bay. "I know what you must think of me. You probably think I had betrayed you by not naming you deputy. But I promise you, I wanted you to be deputy. I just ... couldn't. I couldn't lose you." 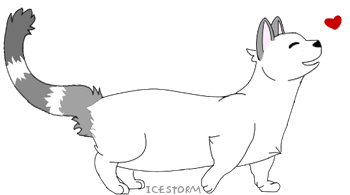 Following Scorchstar out of the camp and into the marshy plains, Daisyflame walked along side his friend, his white paws dragging in the frost covered ground bellow. Looking up as the leader began to speak, their gazes met and as he began to explain his decision, the warrior's once hardened, cold heart melted into it's usual mushy state. As he listened on, it all began to fall into place and make sense. Of course Scorchstar hadn't wanted to hurt him, and the fact that he even thought such a thing sent a sense of shame to his gut. By the time the dark leader finished, a soft smile sat on Daisyflame's maw. "That certainly seems like an ominous omen," he began gently, looking down to his paws. While part of him began to doubt that it was just a dream that kept him from being deputy, he forced himself to push the thoughts away. This was his best friend for Silverpelt's sake and he had to trust his word or else he would've been a horrible friend, and just imagining his doubt getting in the way of their friendship made the tom want to tear up. "Scorchstar..." Daisyflame mewed softly, moving his gaze back up from his paws so that it met the leader's. "No matter what you choose or where you go, I will stand beside you, always. I will forever be your loyal follower and best friend, no matter what might try and wedge its way between us, I will always respect and love you," he purred. Taking a couple steps forward, the ginger and white pelted tom nudged his muzzle against Scorchstar's cheek, embracing his warm and family scent, one that he would never get sick of. "I'm sorry I acted like such a selfish mousebrain. I should've known there was a good reason," he added, closing his eyes as their pelts brushed against each other ever so gently.